A wooded hill on the north edge of town is all that separates Tha Ton from the border and Burma’s Shan State; you can’t miss it thanks to Wat Tha Ton sprawling up the entire hillside. 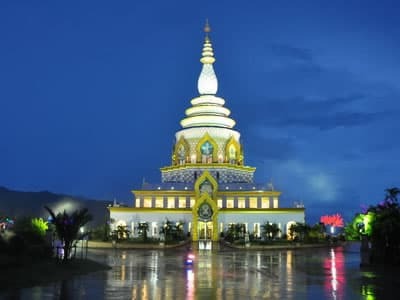 The temple includes an eclectic collection of shrines, statues, Buddha images — both Thai and Chinese styles, seated and standing — and increasingly impressive views as you ascend, culminating in the huge multi-coloured, hilltop pagoda. A lot of hilltop temples feature in this mountainous part of the country, but this is one of the best.